Jupiter is a wonderful, small coastal town and part of the charm is being able to access our free beaches anytime you like. We have over 5 miles of clean, wide beaches where the daily buzz of beach-lovers permeates the air. At any time you might find walkers (with and without dogs), cyclists heading along the famous Beach Road as they make their way northward to Jupiter Island, kite boarders speeding along the shore, surfers or beach fisherman. This is certainly the place for people who love the beach and the closer you are to the beach, the more you can enjoy it. 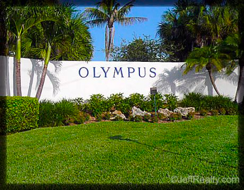 One of the closest places to live near the beach are the single family homes in Olympus. 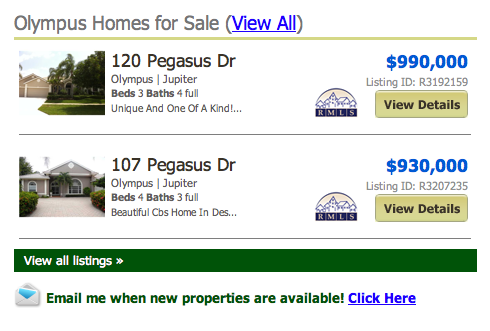 Olympus Homes online now. All listings & Sold Statistics! Olympus is a rather small community of only a couple of streets and 117 single family houses. They range in size from about 2,200 square feet of living space to nearly 5,000 and some have 5 bedrooms with 4 baths. Each house is custom and different from all the others and most have private pools. Inside you might find Saturnia or hardwood floors, custom window treatments, granite counters, stainless steel appliances and a wide diversity of floor plans. But the real attraction is the location between US One and the Beach Road. This means all that our fabulous beaches offer is less than ½ mile away. Even the Jupiter Lighthouse and the Jupiter Inlet are only a short drive northward. Our tropical ocean breeze will sweep through the community every day and beach activities will become part of your lifestyle. The shops and dining of Jupiter are only about a 5 minute drive away and slightly north of Jupiter you will find more shops in Tequesta. If you want to visit the shopping and dining mecca of Palm Beach Gardens, all of this is just a 10 minute drive to the south. Posted in Jupiter homes, Uncategorized on August 14, 2011 at 5:54 pm.